This is the most natural palette to translate for children's interiors. The pastels that we have seen over the past few years continue in strength with this grouping of soft, muted colours. 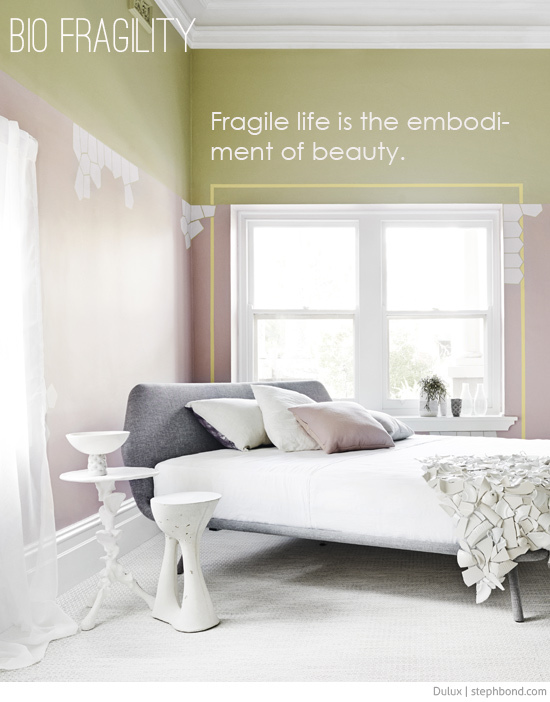 Styling: Bree Leech & Heather Nette King for Dulux Colour Trends 2016 - Bio Fragility palette. Paints used: Dulux Wash & Wear 101 Barrier Technology in Matamata, Partita, Lilac Suede, Deduction and Dulux Aquanamel in Snow Season Quarter. The beautiful Porcelena Bowl on the side table was made especially for this colour story by Melbourne designers Porcelain Bear. What do you think of this style? I'll bring you the other three Dulux 2016 colour stories over the next few weeks.